Abdurahman Alamoudi was considered the “pillar of the Muslim community” in Washington, D.C.
Abdurahman Alamoudi created and/or led nearly two dozen of the largest Islamic organizations in North America, was a “Good Will Ambassador” for the U.S. Department of State, created the Muslim Chaplain program for the Department of Defense, worked with the Department of Education to determine what went into American public school texts discussing Islam, and met with U.S. leaders across the spectrum. And Abdurahman Alamoudi was a financier for Al Qaeda. 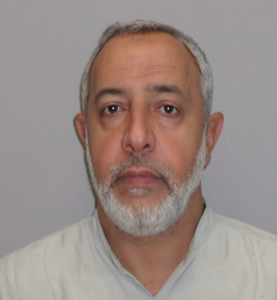 Alamoudi was arrested at London’s Heathrow Airport in 2003 with $340,000 cash he got from the Libyan government for the global jihad. He said he found it outside his hotel room. He was extradited to the Eastern District of Virginia (Alexandria) where he pled guilty to an 18 count indictment. Alamoudi was also caught on video in 1999 speaking adjacent to the White House grounds publicly declaring he is a fan of Hamas and Hizbollah – both designated terrorist organizations – to the loud cheer of the Muslims attending. It should be noted this behavior did not get him fired from his positions inside the U.S. government. Let’s review: Abdurahman Alamoudi was the Islamic advisor to President Clinton and then went on to work with the Bush administration. Alamoudi created the Muslim Chaplain Program at the DoD, worked as a Good Will Ambassador for the State Department, was widely recognized as a “moderate Muslim,” had unfettered access to the highest levels of power in our government, publicly pronounced his support of terrorist organizations and was an Al Qaeda financier who plotted with two UK-based Al Qaeda operatives to kill Saudi Crown prince Abdullah, who went on to become King Abdullah. Many of the Muslim chaplains assigned by Alamoudi are still working with our military. The numerous Islamic organizations that Alamoudi created and led, and the individuals who worked with him providing material support to Al Qaeda, Hamas, and the Muslim Brotherhood, can still be found walking the streets of Washington, D.C., the halls of Congress, working with the national security staffs, and elsewhere in America. This dangerous pattern of our leaders and our media lifting up and proclaiming leaders in the Islamic community “prominent moderate Muslims” continues today. Funny how so far they all turn out to be terrorists. The time for the final crusade is NOW. Why is so little support given to the real Muslim reformers like Juhdi Jasser, Ayaan Hirsi Ali and Raheel Raza? According to research data accessible in the public domain, even prior to his election, Bush 43 was being represented at “meetings” in Washington (customarily on Wednesdays) by a triad of political-influence activists in quest of middle-east money, I.e. whose (paraphrased) thesis was, since American Jews fund the Democratic party why shouldn’t the Arabs fund the Republicans. And if in fact he was seeking “advice” from Abdurahman Alamoudi, aka “pillar of the Muslim community” in Washington DC/Muslim-Brotherhood terrorist — he was doing so to the obvious detriment of U.S. National Security and safety of the American people — which would explain how the entire bin-Laden clan managed to flee the United States on the heels of 9/11 to avoid being contextually deposed by the FBI. Considering too that “43” also retaliated to Saddam Hussein’s death threat to his father by sending 4000 U.S. Marines, Army infantrymen and variety of special forces personnel to their deaths in Iraq, in connection with which he now provides bizarre mea culpa bicycle rides in Texas to limbless survivors in order to quell guilt for what was nothing more than a treasonous deployment of young men & women in the singular interest of personal revenge — nothing he does should surprise us, including seeking “advice” from barbarians!